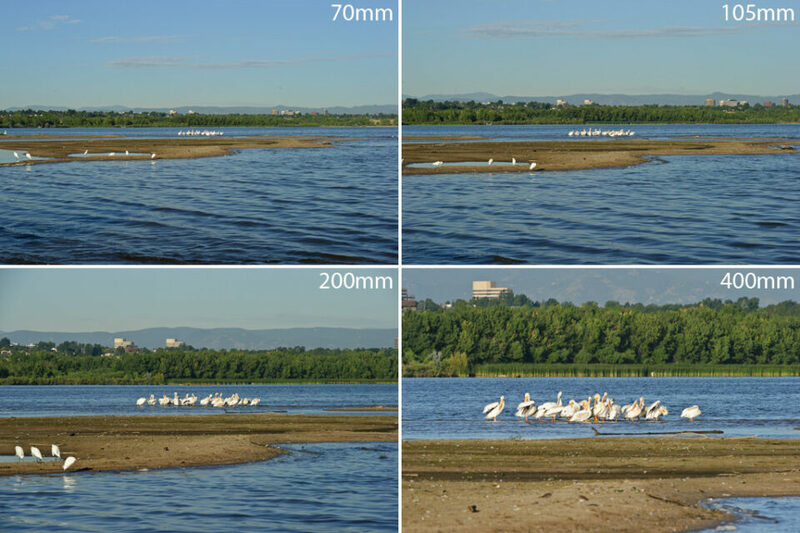 The above images are not cropped in post-production and represent equivalent focal lengths relative to 35mm. 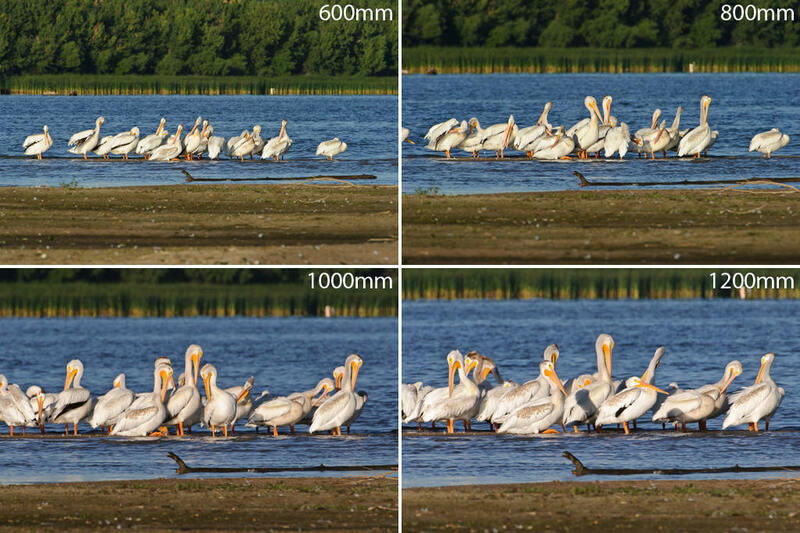 The longest field of view of the 1200mm shot was captured with the Nikon 200-400mm f/4.0 + TC-20E III TC @ 400mm (800mm effective) on a DX body, which is equivalent to 1200mm. The shortest focal length was captured with the Nikon 70-200mm f/2.8G VR II at 70mm. Wouter, you are most welcome! Unfortunately, the subject distance information is not available in EXIF… I can only give you a rough estimate – I would say around 15 meters from me to the birds. Aaron, an EXIF viewer can only show the info if it is available :) The distance information is typically reported by a lens and if you are shooting with teleconverters and shooting over a certain distance, the information can fail to come through. If that happens, the camera will show a really large number or “unknown” for distance. Haha, I didn’t consider that the teleconverters might mess with that. I figured the camera would factor it in with the newer electronic ones and D/G lenses, but I guess not huh? We get your information from the internet. It is honor for me to have this opportunity to introduce my products, company and myself. I am a salesman from Changchun Richen Optronics Co., Ltd.. My name is Mike who comes from Changchun city Jilin province China. 1. All kind of wide angle lens and telephoto lens with different size. 2. Large-scale focal variation monitoring lens. Changchun Richen Optronics Co., Ltd. is a professional enterprise, which located in Chinese optical base-Changchun City. It is mainly engaged in manufacturing and marketing of optical lens, since established in 2000, it has been a professional manufacturing with large scale producing ability. At present, we mainly export to Europe, America and Japan etc. Wow, thanks! Just the info I was looking for. Can you explain what you mean by 800mm effective with a 200-400mm lens? How do you get a 1200 mm focal length with a 200-400mm lens? Thanks! I will definitely buy my telephoto lens by clicking on the B&H link on your website! great comparison. i’ve been a fan for reading reviews on your website regularly. you can get 800mm effective from a 200-400mm lens by using TC-20E III just like nasim wrote before. TC-20E is a 2 times teleconverter combine with 400mm focal length it becomes 800mm and when 800mm lens mounted at DX cameras (crop factor 1.5x body, series other than D700, D800, D3, D3x, D3s, D4) then it becomes 1.5 x 800mm = 1200mm lens. Thanks Raymond. I understand the teleconverter, Nasim was saying 400 mm is 800 mm effective. What I don’t understand is why this is 1200 mm equivalent… What is the mechanism? Is it that those cameras are at normal lens at 50mm rather than 35 mm?